A mid 20th century gold, ruby, sapphire and diamond articulated band ring, the square-shape sapphire and ruby line to the hinged half-circle single-cut diamond line sides. Estimated total diamond weight 0.20ct. 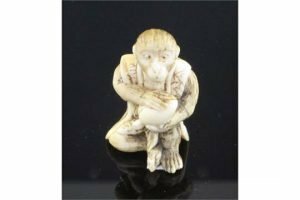 A Japanese ivory netsuke of a seated monkey holding a peach, signed Kogetsu, Meiji period, the monkey wearing a brocade pattern waistcoat. 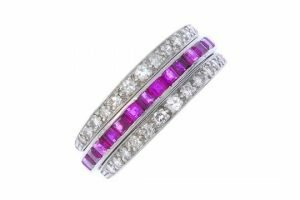 A diamond cluster ring, the rectangular-shape diamond line within a brilliant-cut diamond surround, to the plain band. Estimated total diamond weight 1.85cts. Principal diamond estimated weight 0.30ct. 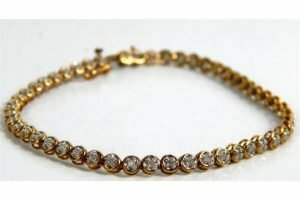 A 9 carat gold and diamond bracelet, the riviere setting with illusion cut diamonds, on a snap clasp, 5.6g. 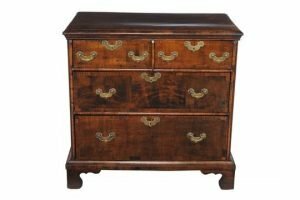 A walnut chest of drawers, 18th century, the cross banded rectangular top with central oval and moulded edge above two short and two long drawers, raised on a plinth and bracket feet. 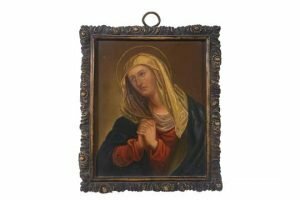 A Continental parcel gilt bronze and enamel personal devotional plaque, late 19th century, of the Madonna and Child. 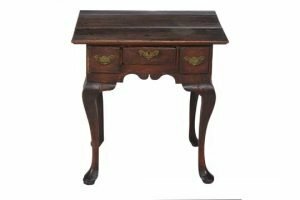 A George III oak side table, circa 1770, the rectangular plank top above three drawers, shaped apron, and cabriole legs terminating in pad feet. 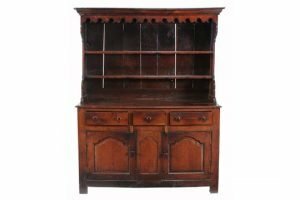 An oak high dresser, second half 18th century, the carved frieze above two open shelves, the base with three drawers and two panelled cupboard doors. 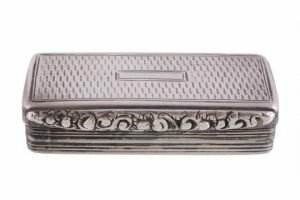 A William IV silver rectangular snuff box by Edward Smith, Birmingham 1830, with a vacant reserve to the engine turned cover, a floral and foliate chased thumb piece, threaded sides, an engine turned base, the interior gilt. 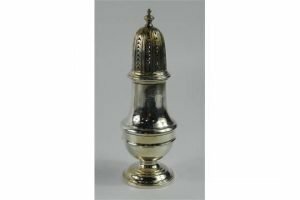 A silver sugar sifter of baluster form, with pierced top and acorn finial, Birmingham 1973. 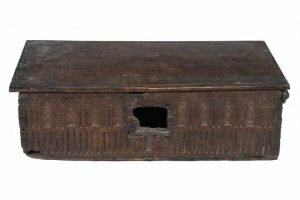 An oak bible box, second half 16th century, with lift top and original hinge above decorative frieze, with cross motifs within arcaded and columnar border. 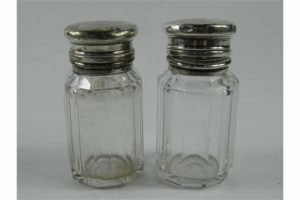 A pair of cut glass dressing table jars, each with plated mounts and hinged lids bearing a crest of an hen. 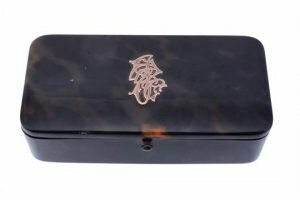 A Continental solid tortoiseshell oblong jewellery box, early 20th century, plain with an applied gold monogram to the cover, the interior base velvet lined. 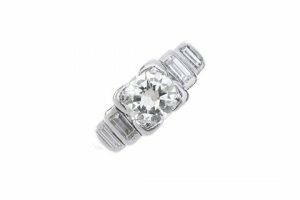 A diamond single-stone ring, the brilliant-cut diamond within a corner claw setting, to the baguette-cut diamond shoulders. Principal diamond estimated weight 0.70ct. 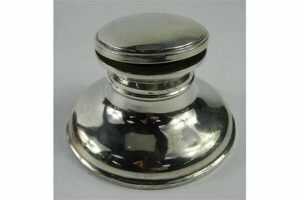 A George VI silver inkwell of capstan form, with clear glass insert and formed wooden base, Birmingham 1937. 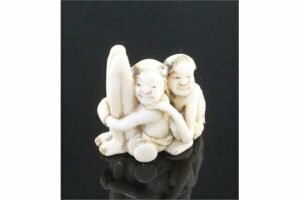 A Japanese ivory netsuke of seated Ashinaga and Tenaga, Meiji period, with some stained detail to their hair, unsigned. 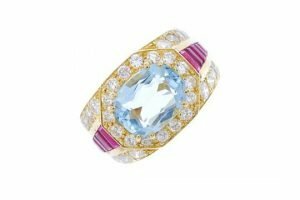 An aquamarine, ruby and diamond dress ring, the oval-shape aquamarine within a brilliant-cut diamond surround, to the similar-cut diamond and tapered baguette-cut ruby line shoulders. Estimated total diamond weight 1.50cts. 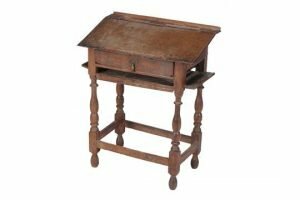 An oak scribe’s desk, early 18th century, with fixed writing slope above a single drawer, with later compartments and original acorn pattern handle, the sides and back with quill rests, on turned baluster supports and stretchers. 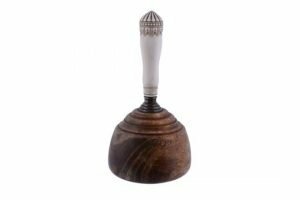 A silver mounted ivory and walnut presentation mallet, the tapered ivory handle with a lobed, beaded and foliate carved terminal, the moulded and rounded walnut head inset with a silver roundel. 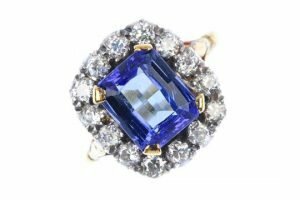 A tanzanite and diamond cluster ring, the rectangular-shape tanzanite within a brilliant and old-cut diamond surround, to the trifurcated shoulders and plain band. 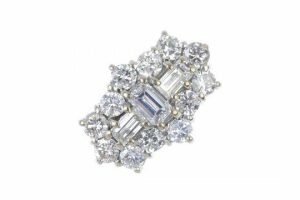 Estimated total diamond weight 0.90ct.